In this part-time position, Jim assists in coordinating functions including Extraordinary Ministers of Holy Communion, Lectors, Ushers, Servers, and Sacristans. The Liturgical Coordinator prepares and updates policies and manuals, coordinates training for ministry volunteers, and maintains a current data base for all ministries. 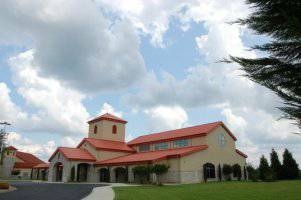 Jim also provides management and oversight of the St. Thomas columbarium, including records, policies, and grounds. As a volunteer, Jim supervised the construction of the columbarium in 2005, and has administered it since. Jim and his wife, Faye, moved from Maryland to Tennessee in 1997. His extensive service at St. Thomas the Apostle during the past seventeen years has included serving as Sacristan, Lector, Extraordinary Minister of Holy Communion, and Altar Server. He also served as Chairman of the Church Design Committee for our new church.